Supply the most dependable, most powerful and most reliable equipment along with a crew that has a qualified leader (years of experience), properly trained and motivated to work hard by receiving good wages, health insurance and a good retirement plan. The work force at APC starts with the owner and his 36 years of experience in this industry, the leadership team has 10 members all with APC for longer than 25 years. The work force consists of another 15 men all with APC for an average of eight years. We come to your location at no cost to the customer to discuss, plan and estimate costs for the project. Our years of experience help solve all associated difficulties in performing a project. Honest, sincere discussions help the customer focus in on the difference between APC and its competitors. Due to the fact APC has superior equipment, well-trained work force and knowledge and experience on how to perform jobs has resulted in APC typically being two to three times more productive finishing jobs faster resulting in less cost than our competition. We guarantee positive work performance and effort. The philosophy of APC is to keep our customers satisfied, so that on the next job they will call APC with no hesitation. APC is motivated to work hard for a one-day job the same way as it is for a two-month job. We put the same planning in for all jobs. The crews are trained in Hazardous Waste Work Safety, Confined Space Entry, Rescue and Retrieval in Confined Spaces, Lock Out/Tag Out, Respirator Training with full annual employee medical evaluations, Hearing Protection, Personal Protection Equipment, DOT Training, Training in Trenching and Excavation Procedures. Over 36 years of business, APC has been compared to an expertly trained special forces. We are trained on all equipment and how it works best, we attack the jobs aggressively to get the job done safely and quickly, we finish usually two to three time faster than our competitors. 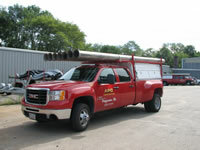 APC has increased its fleet over 36 years to have all necessary equipment to perform even the most unique and difficult jobs. APC can clean hot flyash Precip. Hoppers, flyash Silos Hydro evacuation or Retention Ponds in a subdivision. APC has licenses to transport Hazardous Waste in Massachusetts, Rhode Island, New Hampshire, Maine and Vermont. We also have the license and the training to perform hazardous waste spill clean ups. APC from the beginning, in 1975, has always had a desire to own all of its equipment, for all specialized jobs. We maintain all equipment 100% and are assured that all equipment on a job is in top working condition. APC does not use subcontractors; we provide all crews and equipment, so that the customer is 100% guaranteed that APC is 100% responsible for completion, production and a timely finish for each task at hand. This all results in customer satisfaction.